Skullcandy offers a panoramic range of audio products that cater to different tastes and earbuds across the entire gamut of listening audiences. Quality sound performances blended effortlessly with a fashionable build, the products aim to score big on all counts. Together with the power they pack in the music and the chic sense of style, the SkullCandy Skullcrushers are well on their way to becoming the best over-ear headphones in the midrange market. The Skullcandy SCS-SCBP3.5 Skullcrushers Subwoofer Stereo Headphones comes as a pair of closed back, circumaural headphones that pack in the punch with their powerful 30mm drivers and vibrant bass. The inbuilt bass-enhancer ensures a booming thump for audiophiles craving for the stereo effect in their headphones. Overall, the music experience from the product competes with some of the best high-range head phones available in the market. 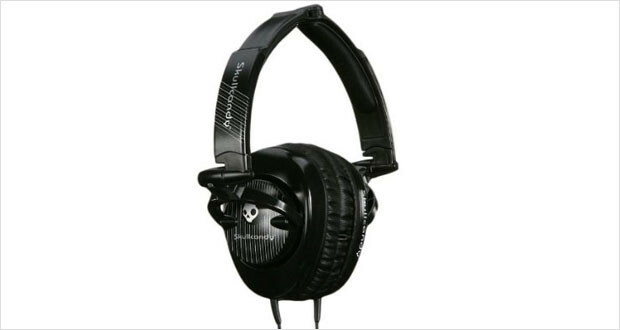 SkullCandy merchandises are known for their quirky fashion sense, and the SkullCrushers are no different. The plush and cosy soft-leather earcups provide a snug fit that passively cancels out ambient noise. Add to that the supreme bass, and the SkullCrushers prove to be on the one of the best noise-cancelling headphones in the industry. AA Battery Bass amplified subwoofer system. TheSkullcandy SCS-SCBP3.5 Skullcrushers Subwoofer Stereo Headphones are circumaural headphones with 3.5mm gold-plated plugs. Surprisingly light and very strong, the headphones pack in the right amount of punch. Tight fit ensures passive noise cancellation with the plush, soft-leather earcups providing comfort to the ears. Cable length is fairly long. The best feature of the headphones is the fact that they fold, thus cutting in on storing space. Dimensions 7 x 3 x 6"
The headphones offer a good, strong build with strain-relief technology incorporated into the wires so as to provide enhanced lifespan. The soft-leather earcups are fairly comfortable but tend to produce sweat with extended use. The otherwise light headphones are weighted down by the cumbersome and heavy subwoofer controller with the batteries in it. The highs are suppressed if the bass is on too high. Vibration speakers ensure supreme bass, with flexibility in control provided by the in-line bass adjuster. Considerable noise isolation with good passive noise cancellation. Smooth tones across the scales with minimal distortion makes for good sound performance by the headphones. Be it style or substance, the Skullcandy SCS-SCBP3.5 Skullcrushers Subwoofer Stereo headphones deliver what they promise. They provide clarity without any muddiness or distortion across the sound board and are exceptionally well suited for those with an ear for thump. The inherent bass adjuster allows tweaking for adjustment according to the music and/or user preference. As a moderately priced, portable media device, the headphones are quite the steal.